Top Hat Restaurant has been named one of the Malaysia’s Best Restaurants multiple times by Malaysian Tatler and it’s not difficult to see why. Set in a beautiful colonial bungalow at the crossroad of Jalan Kia Peng and Jalan Stonor, it’s prime location attracts loyal local fans as well as tourists and local embassy staff. Top Hat’s interior is a unique blend of East and West with local art pieces on the walls, luxurious curtain drapes, various antiques, vintage furniture with warm earth tones of brown, yellow and red. During the day, the dining room is bathed in natural light from the side windows and exudes a relaxed atmosphere. It’s a cosy place to dine, almost like you are at a Nyonya’s humble home. There are also several themed private rooms, complete with a large garden with plenty of greenery and Koi pond. It’s no wonder Top Hat frequently hosts corporate functions as well as weddings. The kitchen is run by 3 Chefs: Head Chef Richard Moreira who draws on his Eurasian heritage to create both Western and Malaysian cuisines; Sous Chef Yen Soon who loves to using Chinese ingredients in his Western cuisine; And Pastry Chef Ineh Bibi who’s responsible for the desserts. As expected, the menu here features both Western and Asian dishes, with the latter focused more on Malaysia’s unique Nyonya cuisine. The dishes rotate every three months, although the signature dishes never come off the menu. Prices here are reasonable as the portions are above average. There is also an extensive wine list of Old and New World wines, and if you need any assistance, they are more than happy to do the wine pairing. The restaurant’s namesake, also known locally as “Pai Tee”, is a popular Nyonya dish (RM12 for 6). A savoury mix of shredded Chinese turnip and Carrots set in pastry shells, paired with a homemade sweet and sour sauce; here they are larger than normal, but no less elegant. 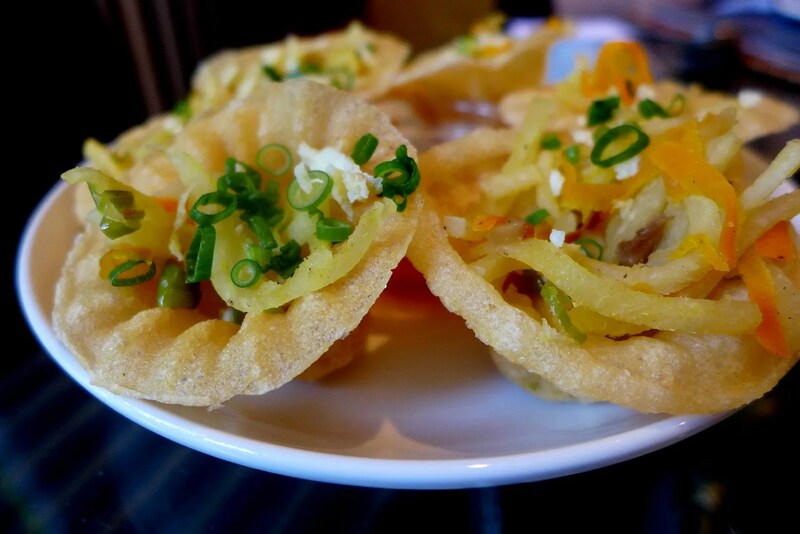 It’s a delightful starter with the thin and crispy shells and crunchy vegetables. Top Hat prides itself by making everything from scratch using the freshest ingredients. 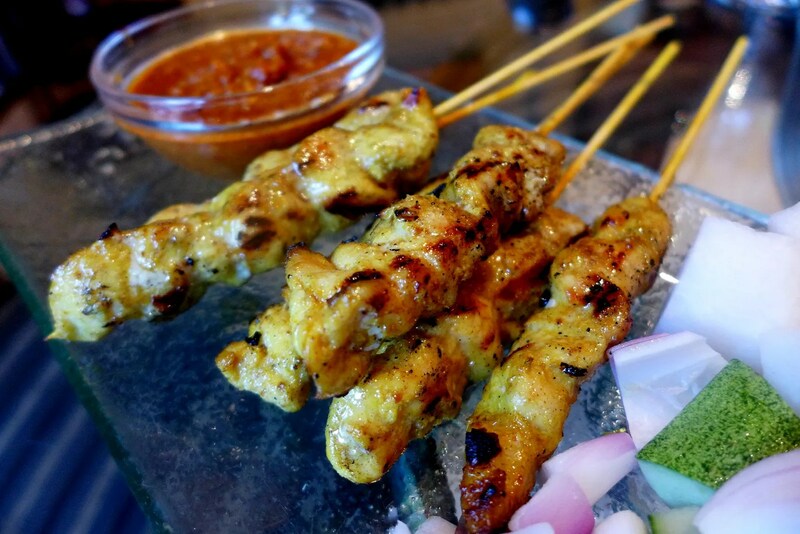 The Chicken Satay is served with a thick peanut sauce (RM20 for 6), each skewer packed with juicy lean meat with a good bite. 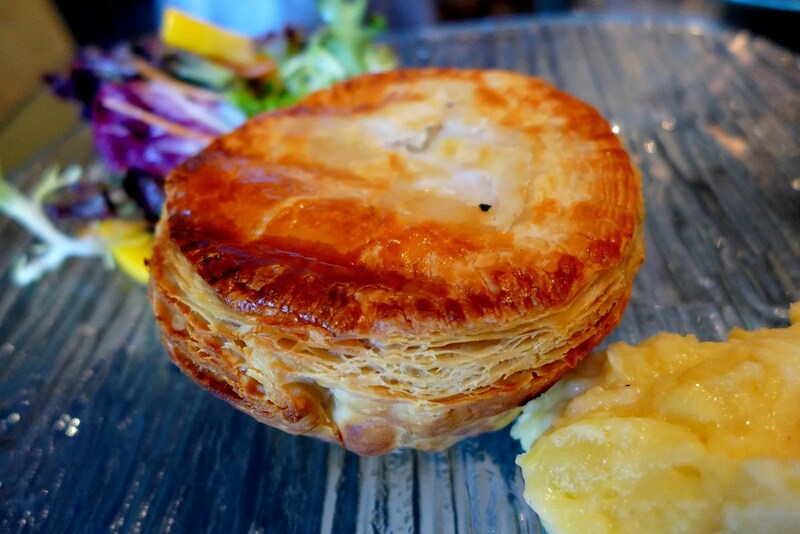 If you are curious about their Western dishes, the Chicken and Mushroom Pie (RM35) is a must order. The puff pastry is perfectly airy and crispy and the creamy savoury filling will have you reaching for more. Its richness is offset by the sweet and tangy salad with mango. 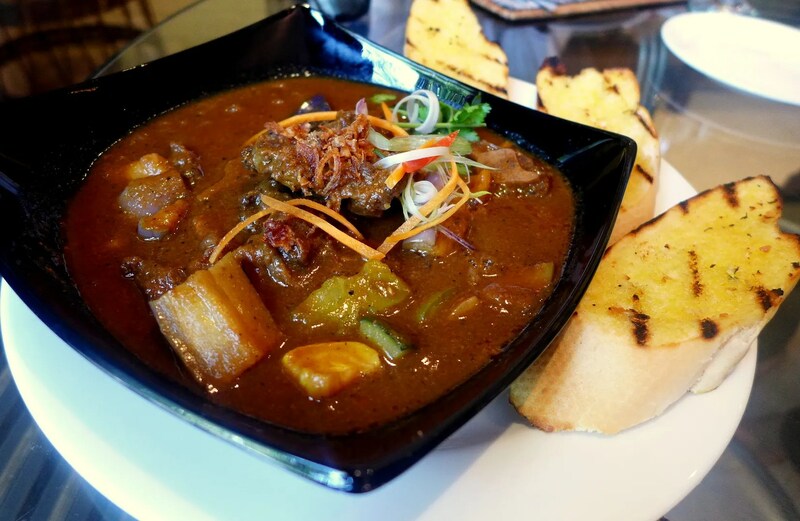 The Chef’s Signature Oxtail Stew (RM48) is braised for more than 4 hours, which explains the wonderfully textured meat with rich, dark gravy with great depth of flavour. The vegetables are grilled to bring out their sweetness before adding to the stew, and there’s a hint of tang from the tomatoes. Best to enjoy with toasted garlic bread to mop up every last bit of the sauce. 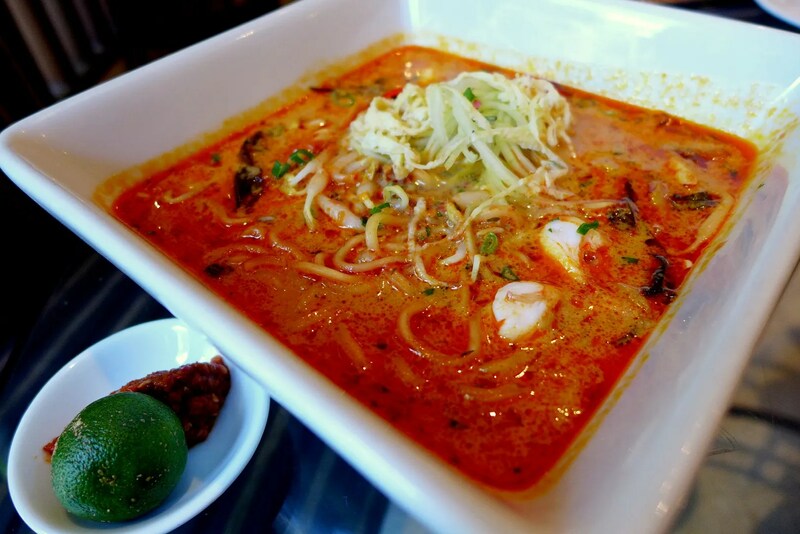 Some diners visit Top Hat exclusively for their Nyonya laksa (RM25), and it’s probably the best in town. This is the owner’s family recipe, with the broth made fresh every single day. The Nyonya Laksa here features a creamy coconut broth, yellow noodles (or rice vermicelli), prawns, chicken and bean sprouts. It has a unique aroma from torch ginger bud, lemongrass and shrimp paste; the addition of lime and sambal as extra kick complete the addictive and decadent treat. The portion is quite intimidating for one with a small appetite, so be prepared to share. 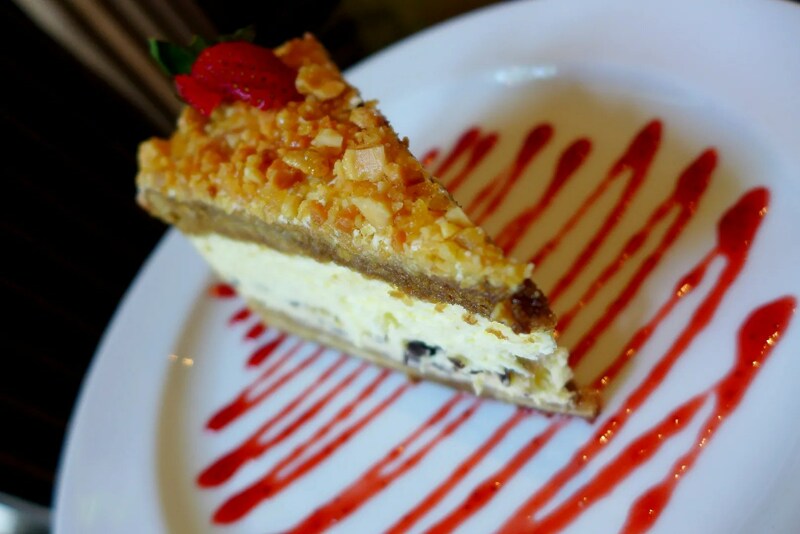 Desserts here are split into local delights and Western classics. The Signature Tiramisu Cake is served with fresh strawberry sauce, a rather unique combination but strangely works, thanks to the nut crumble on top. It has a hint of coffee and a rich mascarpone layer, definitely not a dessert for the faint-hearted or weak-kneed. 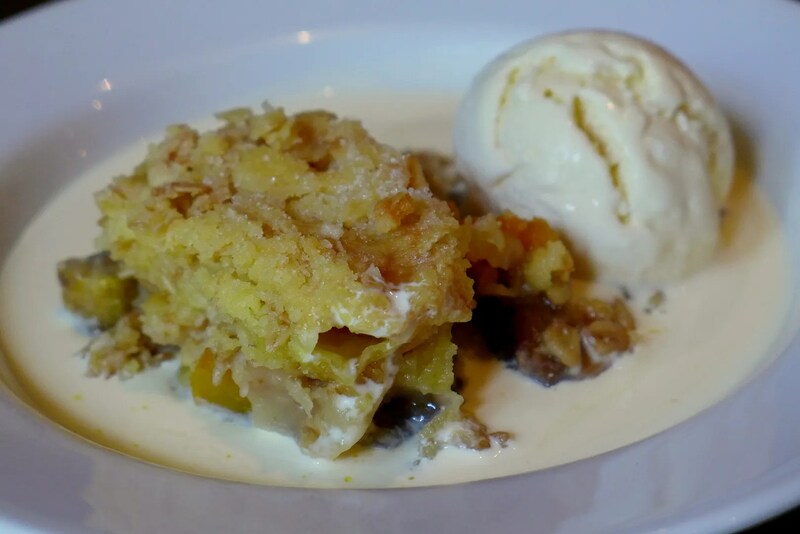 Another must try is the Peach and Banana Crumble served with Homemade Vanilla Ice Cream. It’s as comforting as it gets. There’s no doubt that Top Hat serves unpretentious fare, much like a home-cooked meal with a touch of elegance. It’s well worth a visit if you want to try something very different from the usual KL restaurant visit, there’s something very magical and romantic about this place and the attentive staff just give it that little extra special something. This writeup was published on The Malay Mail on 14th March 2014.
heard alot about this place but have yet to go, one of these days hopefully! it’s pleasant to read this weblog, and I used to visit this web site everyday.